I recently had the opportunity to review a piece of custom photo jewelry from jYOUlry and I chose the purse hanger. While at a restaurant in Newport last year, I saw a girl pull one out to hang her purse from a nearby table and thought "hmm, that's a cool little gadget... I've got to get me one of those..."
The purse hanger is truly a must-have accessory. It keeps your bag off dirty floors and safely nearby almost anywhere. Hang it next to you while seated at a restaurant table or in front of you at the bar. It's even cooler when personalized, but be prepared for the questions and admiration from the waitresses, especially if you've got your furry pack on display (I'm sure the non-furry kids get similar reactions as well)! Speaking of which, the purse hanger also makes a nice hook for dog items as well. When not in use, the hook folds up, making it easy to store inside your purse. 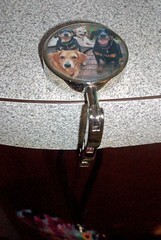 Made from highly polished chrome, the purse hanger features a circle pendant that is customized with any photo or image you choose. A crystal-clear, scratch-resistant resin coating guarantees that your photo remains waterproof. Purse hangers make fantastic personalized gifts for any occasion. A truly unique and thoughtful gift, you'll be sure to get a smile from your recipient! Getting married soon? They also make fabulous bridal party gifts! jYOUlry founder Lisa Yaker, a proud Mom of three, wanted to avoid pulling out the dreaded brag book all the time. Instead she sought a creative way to show off her little jewels, and made a simple photo pendant of her twins. The response from family and friends was so incredible that she began to make more and research additional photo items... and jYOUlry was born. Lisa continues to grow her collection and offer us more unique gifts. Lisa has been kind enough to offer YOU, Lapdog Creations readers, a 10% discount off anything in her shop! Simply log onto her website, choose your items and enter the discount code LAPDOG for 10% off your entire order (offer expires 12/31/2011). You must complete steps 1 - 3 above to enter. You must be a USA resident to win. Deadline for entries is Tuesday, November 29th at midnight. Pretty stuff! Since I just got some new business cards, I think I really should have a pretty case to carry them. I saw one on the site.